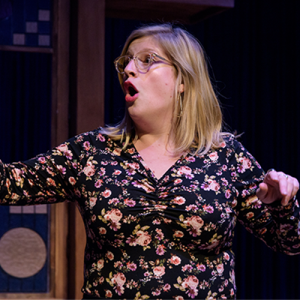 From rural Eastern Shore Md., Erin Murray started performing improv as a college freshman. Erin has taken classes and workshops at Washington Improv Theater and the Upright Citizens Brigade Theatre. She also performs with her fellow blonde duoprov partner in Dream Spooners and with her friends on The Lodge! Erin works full time as an ASL interpreter here in the District. Her go to karaoke songs are “If I Ain’t Got You” by Alicia Keys and “Somebody to Love” by Queen. She loves painting her friends weird, small watercolor pictures, most recently a rainbow chicken daydreaming about ketchup. Her favorite DC spots are Eastern Market and any/all Cava Grill locations.